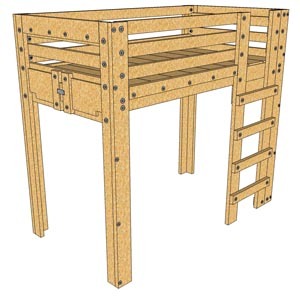 Our queen loft bed plans provide everything you need to build a beautiful and sturdy queen-sized loft bed. 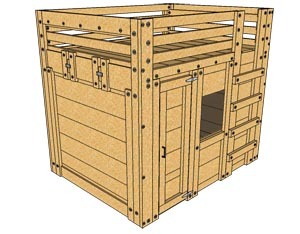 With a simple design, you can easily convert this model to one of our cabin beds in the future. 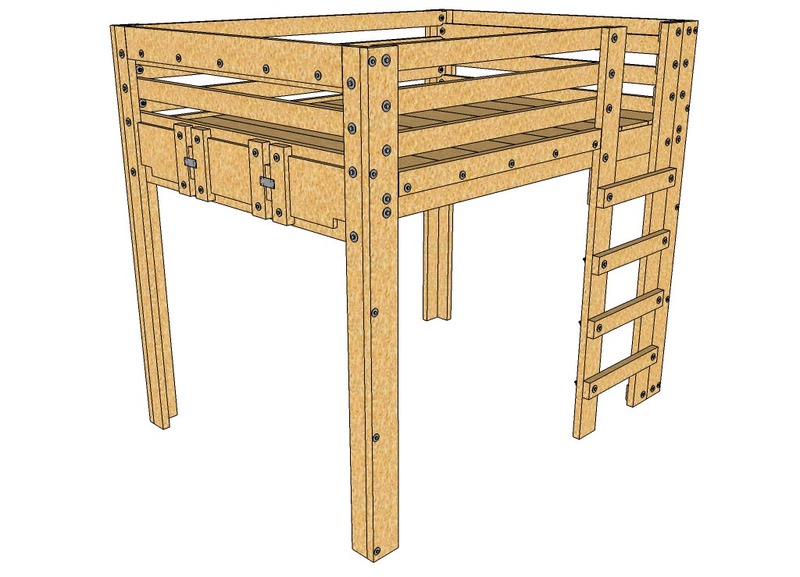 These queen loft bed plans provide a SOLID foundation for an elevated queen sized bed frame suitable for adults or active kids. The design is simple and sturdy with the option to convert the design over to a Queen Cabin Bed. These plans get you started while spending the minimum needed for a queen sized loft bed. Download your digital plans and start building today! Don’t tell anyone, but this thing is super easy to build. I made the first one with some clamps, a hand saw (yes… the old fashioned kind), a square, two sawhorses, a screwdriver, two wrenches and a drill… That’s it! The plans are written to keep the process as simple as possible. No previous woodworking expertise needed. All you need to be able to do is cut a (somewhat) straight line. Also, with supervision, this would also be a fun project for a teenager to complete for a little sibling. Young or seasoned, you’ll be proud of what you have accomplished with these plans! For one child: Placing a twin sized mattress up top leaves plenty of room to play. Plus, placing a smaller mattress up top makes changing the sheets MUCH easier than with many loft beds. You could also place an existing twin bed underneath and leave the entire loft open for play. For two children: Put an existing twin bed+frame underneath and you have a bunk bed without having to discard your child’s existing bed.